After some time off running in 2013 she is back in the running game in 2014 and put in some great efforts, including her first 100 miler! She is really looking forward to 2015 and a big year of races! There are so many to look forward to, she can’t wait! 3rd place, Buffalo Stampede Grand Slam trail race (143kms over 3 days), Victoria. First Australian woman, CCC 101km race in Switzerland. 2nd Alpine Challenge 100 mile trail race, Victoria. 2nd February, La Sportiva Mt. Buller Skyrun 45km, 2nd female. 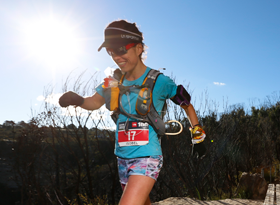 16th March, Australian Ultra Trail Championships, Maroondah Dam 50k, 3rd female. 5th April, Buffalo Stampede, 75kms, 4th female. 25th October, Heysen 105, 105kms, 3rd female. 29th November, La Sportiva Alpine Challenge, 100mile, 2nd female. 17th February: Race 1, Victorian Trail Running Championships, 50kms, Maroondah Dam, 6th woman. 16th March: Roller Coaster Run, 43kms, 1st woman. 2nd June: Race 2, Victorian Trail Running Championships, 50kms, Mt Macedon, 2nd woman. 19th February: 2nd place, Race 1, Victorian Trail Running Series, 50kms, Maroondah Dam. 28th April: 5th place, Rollercoaster Run, 23kms, The Dandenongs. 19th May: 7th Place, The North Face 100 Trail Race. 3rd June: 1st place, Race 2, Victorian Trail Running Series, 53kms, Mt. Macedon. 12th August: 2nd place, The Tan 50k. 13th October: 2nd place: Great Ocean Walk 100. 25th November: First place, Victorian 6 hour and 50k Track Championships.